These are most of the vintage pennants (triangular shape) and banners (rectangular shape) I have in my collection. There are even a few patches. I try to keep up to date with currently offered styles from the campus store, but I haven't scanned those yet. 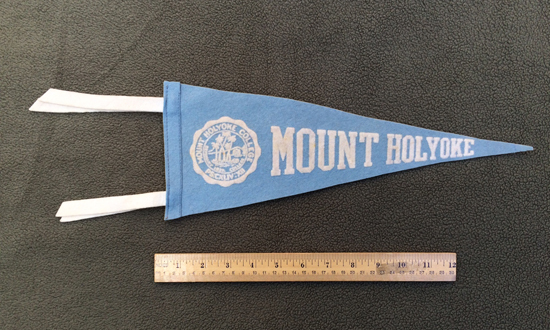 All pennants are photographed with a ruler nearby to give a sense of scale. I apologize for the unprofessional-looking background, but I have limited room in a well-lit area to take photographs of large items. image blue felt rectangular banner with white stitched felt letters. A small label in the bottom left corner reads "5725-5". 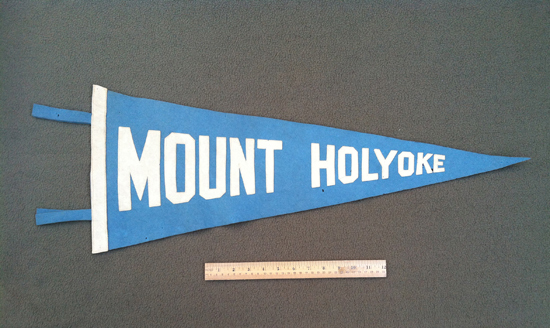 image blue felt triangular pennant with white outlined letters. A label between the ties identifies the manufacturer as the Chicago Pennant Company. image blue felt triangular pennant with white stitched felt letters. 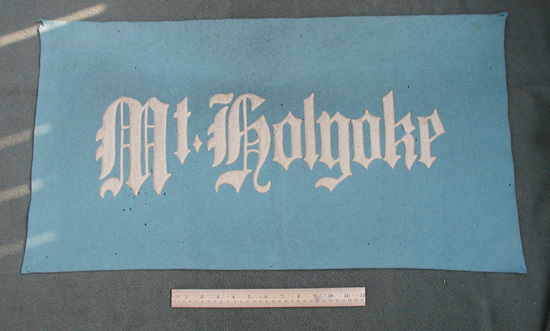 Intricate "MHC" of woven blue letters on a white felt background. Manufacturer unknown. Some moth holes. 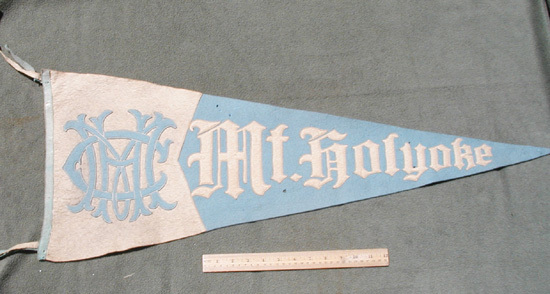 image white felt triangular pennant with blue outlined letters. College seal and some moth holes. A label between the ties identifies the manufacturer as Collegiate Manufacturing Company of Ames, IA. 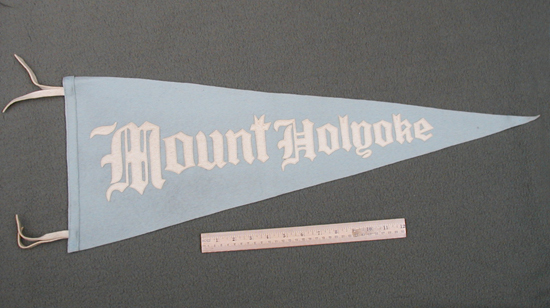 image blue felt triangular pennant with white college seal and letters. Manufacturer's label has been removed. image blue felt triangular pennant with white stitched felt script letters. Some moth holes. Manufacturer unknown. image blue felt triangular pennant with white stitched felt letters. 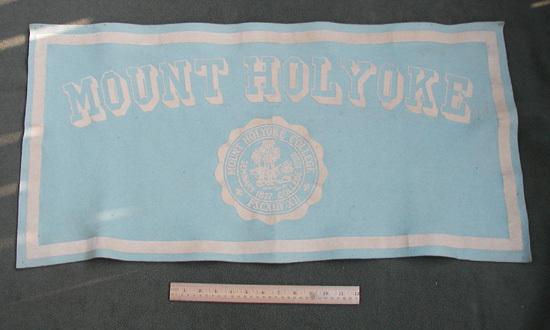 A label between the ties identifies the manufacturer as Green Mountain Studios of White River Junction, VT.
image blue felt triangular pennant with white college seal and letters. Manufacturer unknown. Tip of the pennant has been damaged. 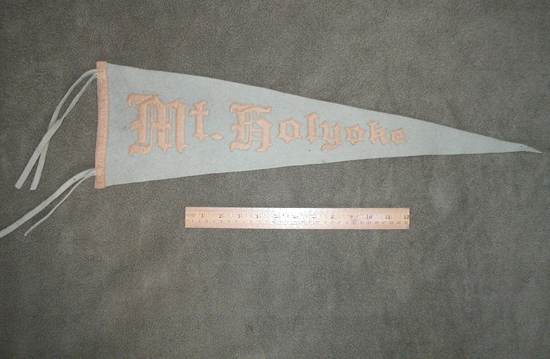 image blue felt triangular pennant with white college seal and letters. Manufacturer unknown. image blue felt triangular pennant with green spine and white palm tree image and letters. No ties. Manufacturer unknown. image blue felt triangular pennant with white stitched felt gothic letters. Manufacturer unknown. image blue felt triangular pennant with white stitched felt letters. College seal is stitched white leather. The dates in the seal are unusual, perhaps suggesting the pennant was made in 1893. Manufacturer unknown. image blue felt triangular pennant with white stitched felt letters. 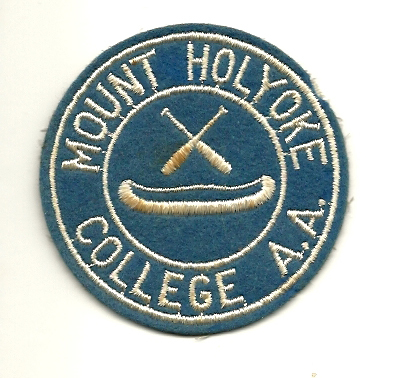 College seal is stitched blue felt. 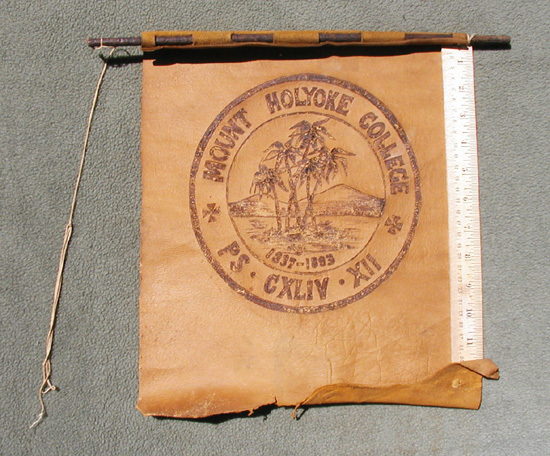 The dates in the seal are unusual, perhaps suggesting the pennant was made in 1893. Manufacturer unknown. image maroon pennant with white stitched felt letters. A map of Massachusetts has South Hadley marked with a red gemstone. Manufacturer unknown. image blue felt triangular pennant with white stitched felt letters. Pennant has unconventional proportions. 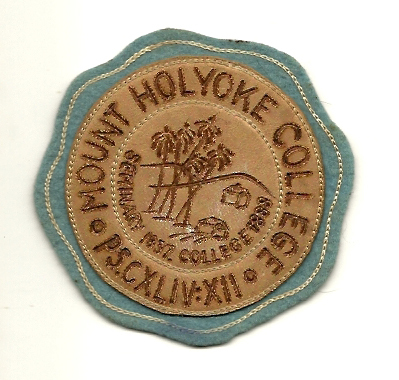 College seal is stitched white leather. Manufacturer unknown. image leather banner hanging from a wooden rod. The string was once used to hang it. 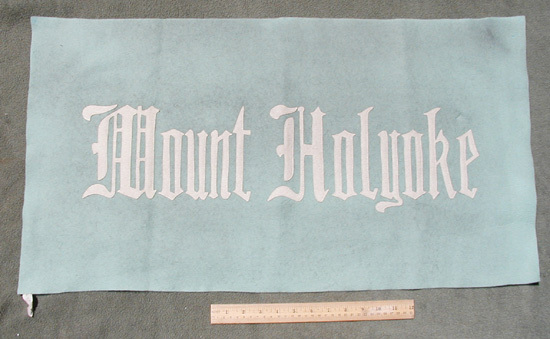 image blue felt rectangular banner with white stitched felt letters in gothic font. Manufacturer unknown. Some moth holes. image blue felt rectangular banner with white outlined letters and white border. Manufacturer unknown. 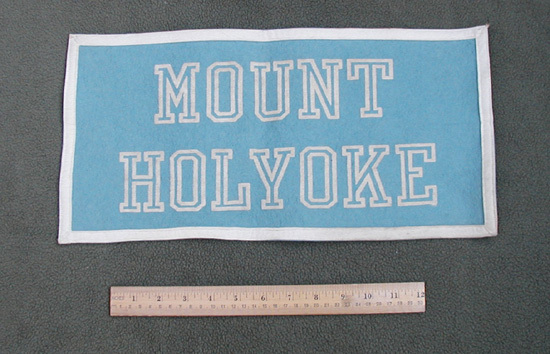 image blue felt rectangular banner with white outlined letters, white college seal, and solid white border. Manufacturer unknown. image blue felt triangular pennant with white stitched felt letters in gothic font. A label between the ties identifies the manufacturer as Langrock Bros. Co., USA. Some moth holes. image blue triangular pennant made of stiff woven nappy cloth with white pasted letters of the same kind of cloth. White triangles decorate the wide end near the two ties. Manufacturer unknown. Damage at the tip, stiff cloth is cracking in some places. Thumbtack holes in the corners. 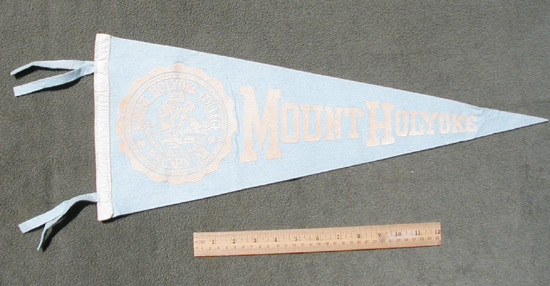 image blue felt triangular pennant with white college seal and letters. Manufacturer unknown. Some stains on white letters and on reverse side. image blue felt triangular pennant with white stitched felt script letters. Manufacturer unknown. 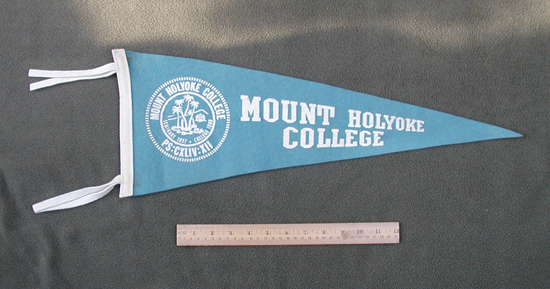 image blue felt triangular pennant with white stitched felt letters and the college seal. Manufacturer unknown. Thumbtack holes in the corners near the ties, and some moth holes in the "M" of Mt. 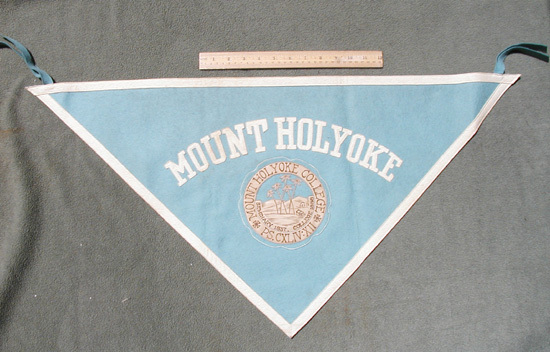 Holyoke, under the seal, and in the tip of the pennant. image blue felt triangular pennant with white stitched felt letters and spine. A label between the ties identifies the manufacturer as Sportswear of Yonkers NY. 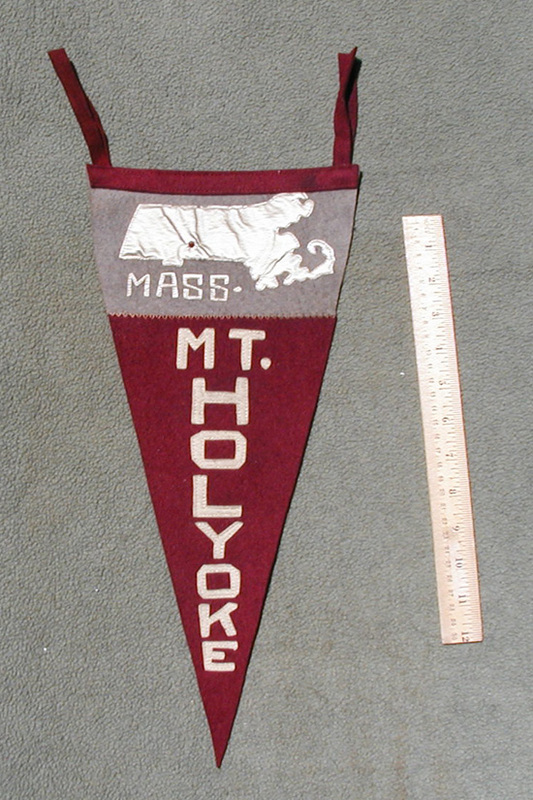 Thumbtack holes in the corners near the ties, and some moth holes under the "H", inside the first "O", under the "K", and between the "K" and the "E" in the word "Holyoke." 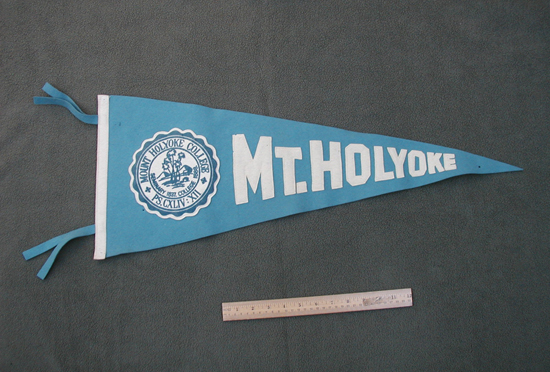 image blue felt triangular pennant with white ties, white raised seal and letters. 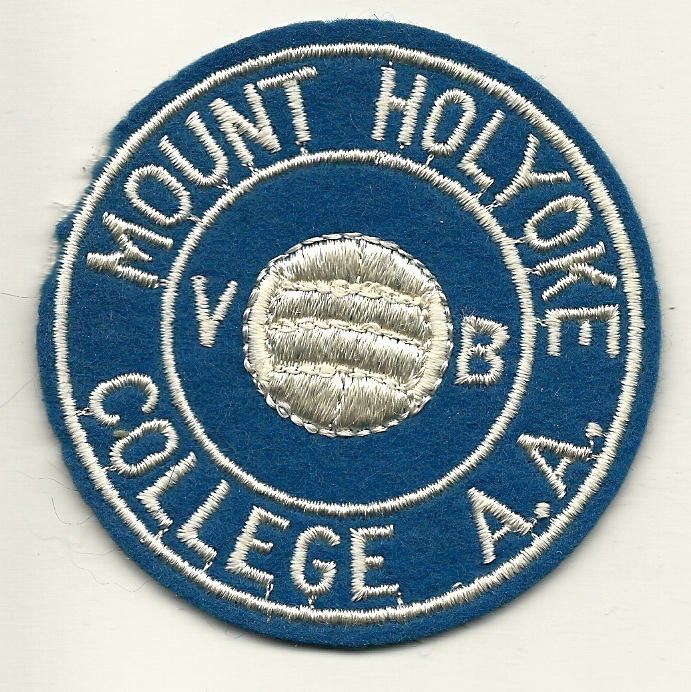 image light blue felt circular patch with scalloped edges and leather Mount Holyoke college seal. About 3" in diameter. image blue felt circular patch with embroidered canoe, oars and lettering. About 3" in diameter. image blue felt circular patch with embroidered volleyball and lettering. About 3" in diameter. 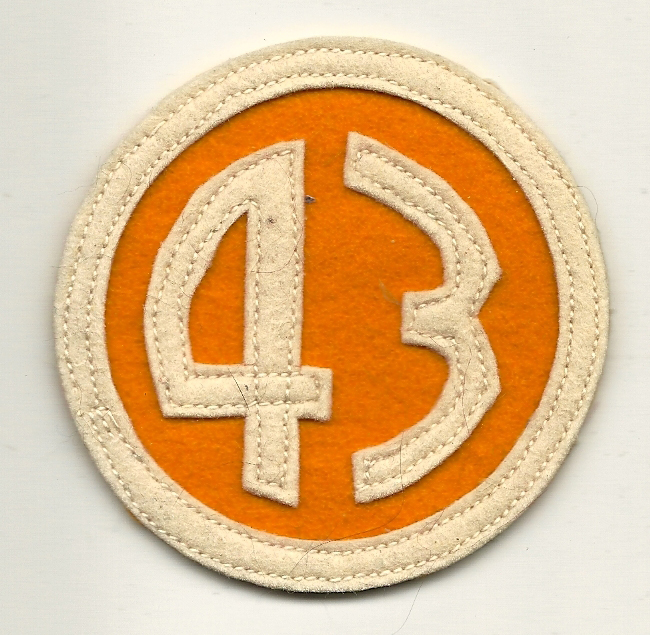 This patch came to me with the class of 1943 patch. image yellow with cream border and numbers stitched onto it. About 2 3/4" in diameter.